With contemporary design and ground breaking innovation the Clearlight Sanctuary C 4 Person Corner Cedar Sauna is unlike any other. The Clearlight Sanctuary Saunas are the only True Full Spectrum infrared saunas available offering advanced near, mid and far infrared technologies. Our robust True Wave Full Spectrum heating system provides all wavelengths 100% of the time to optimize your sauna session. 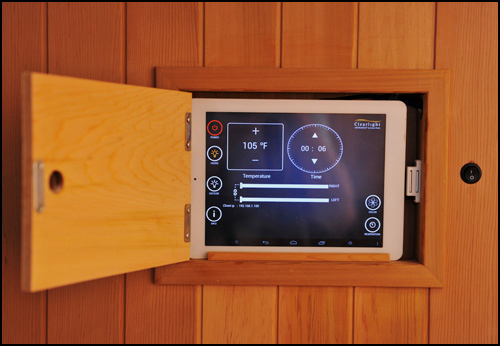 The state of the art digital sauna control works in concert with our sleek tablet/smartphone app to gives you the ability to control your sauna remotely. With contemporary design and ground breaking innovation the Clearlight Sanctuary Saunas are unlike any other. Unmatched therapeutic benefits, LCD "Swivel" Touch Screen with DVD Player and state-of-the-art infrared heating technology are just a few of the characteristic that set the Sancturay apart. Chat with one of our friendly agents at FitnessZone and learn more about the Clearlight Sanctuary C 4 Person Corner Cedar Sauna. 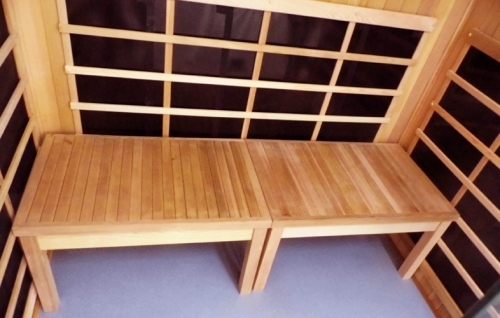 Order your Clearlight Sanctuary C 4 Person Corner Cedar Sauna from FitnessZone.com today! Heater placement in your Clearlight Sanctuary C 4 Person Corner Cedar Sauna is very important. The key to infrared therapy is heating your body directly so you want heat on the front of your body and on the back of your body. 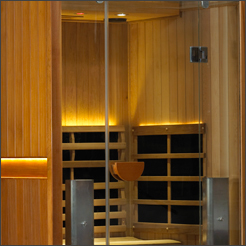 In the Clearlight Sanctuary C 4 Person Corner Cedar Sauna you are surrounded by infrared heat. There are heaters on the front wall, back wall, side walls, underneath the bench and at your calves. The mistake most companies make using carbon heater saunas is they don’t have heaters on the front walls. Without heating the front of your body you will not raise your core body temperature as effectively and you will not sweat and detox as effectively. Call 1-800-875-9145 with any questions you may have about the Clearlight Sanctuary C 4 Person Corner Cedar Sauna. Order this great sauna from FitnessZone.com today! Only Clearlight patented True Wave II infrared sauna heaters combine the high quality infrared heat of Carbon and the high infrared output of Ceramic to produce the most effective infrared heat. Clearlight True Wave II heaters are the most effective infrared heaters available and are designed by Clearlight to specifically heat the human body. Our True Wave Full Spectrum heater system delivers over 20 times the power of our nearest leading competitor. We offer a full 500 watts per heater versus their 10 watt heater. Our patented system allows for the deepest penetration, peak performance with the best results. What differentiates Clearlight far infared saunas from all others? Craftsmanship and our True Infrared II™ technology! 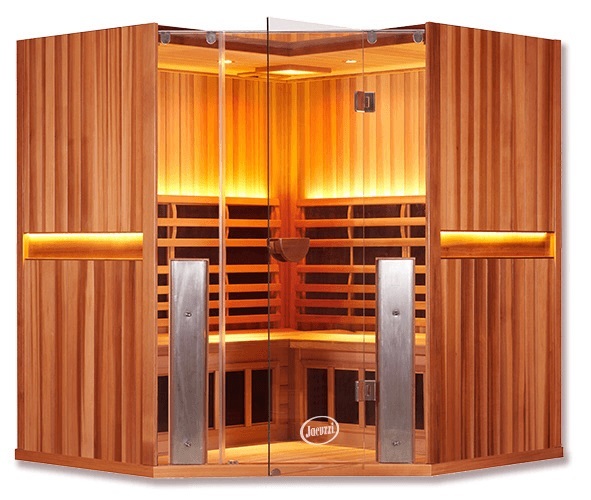 All of our Clearlight™ Sanctuary far infrared saunas are made with the highest quality tongue and groove grade "A" clear Cedar wood and include our advanced True Wave II™ no-EMF heaters making Clearlight™ Infrared Saunas the sauna of choice. 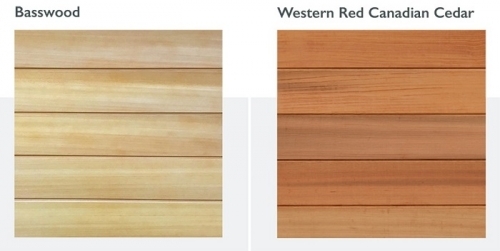 Our Clearlight Sanctuary Saunas are made from Western Red Canadian Cedar. 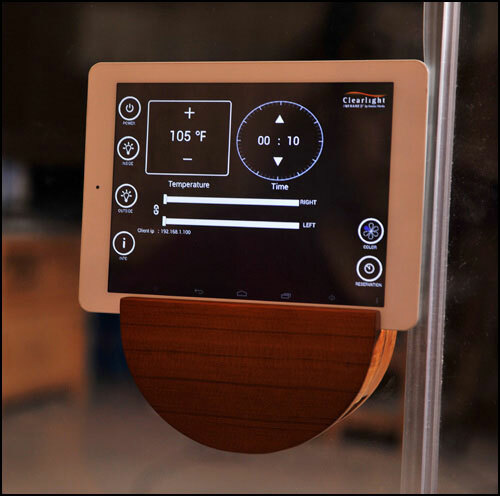 Your sauna includes windows for light and ventilation, recessed halogen accent lights for mood and reading, LCD "Swivel" Touch Screen that controls temperature,time and lights and a high quality AM/FM/CD/DVD stereo with two-way speakers built in. 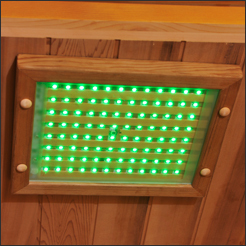 Swivel the control to the inside of the sauna while in use and watch a DVD right on the screen. You can also play video using either the SD card or USB inputs. The Sanctuary Sauna control also had Reservation Mode so you can preset the sauna to turn on anytime in the next 24 hours. All Sanctuary Saunas use our exclusive True Wave II far infrared heaters. 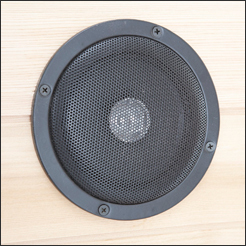 Our True Wave II heaters are the only combination Carbon/Ceramic far infrared heater. We combine both Carbon and Ceramic in to one heater. These heater are truly the best of both worlds. 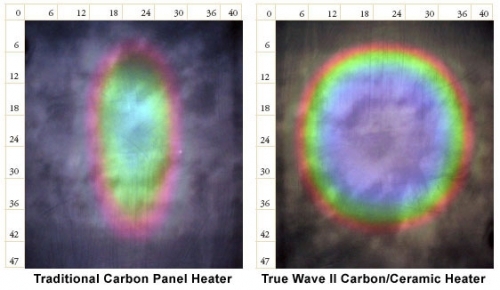 The carbon allow the True Wave II heaters to produce long wave far infrared heat. The long infrared wave will penetrate deeper into your body and give you the benefits you are looking for. The patented organic Ceramic compound that we add to the carbon give the heaters a very high infrared output. Traditional carbon heaters are weak, but not our True Wave II heaters. They produce exceptional quality infrared and a lot of it. Please see the comparison test we performed below. Android Tablet / Smartphone Control (optional). True Wave II™ carbon/ceramic low-EMF heating technology in the back and side walls and Clearlight True Spectrum™ full spectrum front heaters. Easy Installation (normally about an hour). Your Sanctuary 2 also includes our Medical Grade Chromotherapy lighting. With 96 LED lights, auto color change mode and intensity controls, you will receive the maximum benefit. 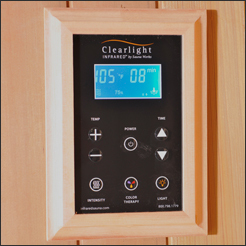 Contact your infrared sauna specialist for more information about Clearlight Medical Grade Chromotherapy. Only our patented True Wave II infrared sauna heaters combine the high quality infrared heat of Carbon and the high infrared output of Ceramic to produce the most effective infrared heat, bar none. We also position our heaters so the infrared heat is concentrated on your body. Since infrared heat travels in a straight line, any heater that goes up over your head is only heating the air. By using our high output heaters, we can concentrate the heat exclusively on your body so you get the most benefit. We also surround you with infrared. The Sanctuary Y has heaters on the front wall, back wall, side walls and one by your calves. In addition there is a carbon/ceramic floor plate heater. We use a high output ceramic tile for the floor heater so it is easy to clean and won't create a sweat smell and bacteria build up. Clearlight Infrared Saunas use Far Infrared energy to penetrate the body's tissue. Tests have shown that the energy output is tuned so closely to the body's own radiant energy that our bodies absorb as much as 93% of the far infrared waves that reach our skin. By comparison, conventional saunas must rely only on indirect means of heat: first, on convection (air currents) and then, conduction (direct contact of hot air with the skin) to produce its heating effect. Your Clearlight Infrared Sauna is best used at temperatures between 100 to 125F versus 180 to 220F for traditional hot-air saunas. Since conventional saunas require 30 to 90 minutes of warm-up before use, electricity costs are reported to be a lot higher than those of Clearlight Infrared Saunas which are ready to use in 10-15 minutes. Swivel the control to the inside of the sauna while in use and watch a DVD right on the screen. You can also play video using either the SD card or USB inputs. The Sanctuary Sauna control also had Reservation Mode so you can preset the sauna to turn on anytime in the next 24 hours. 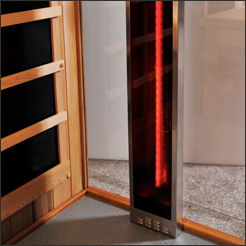 All Sanctuary Saunas use our exclusive True Wave II far infrared heaters. Our True Wave II heaters are the only combination Carbon/Ceramic far infrared heater. 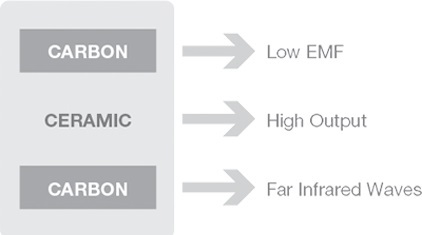 We combine both Carbon and Ceramic in to one heater. These heater are truly the best of both worlds. The carbon allow the True Wave II heaters to produce long wave far infrared heat. The long infrared wave will penetrate deeper into your body and give you the benefits you are looking for. The patented organic Ceramic compound that we add to the carbon give the heaters a very high infrared output. Traditional carbon heaters are weak, but not our True Wave II heaters. They produce exceptional quality infrared and a lot of it. We also surround you with infrared. The Sanctuary 3 has heaters on the front wall, back wall, side walls and one by your calves. In addition there is a carbon/ceramic floor plate heater. We use a high output ceramic tile for the floor heater so it is easy to clean and won't create a sweat smell and bacteria build up. Your Sanctuary 3 has a total of 3,865 sq. in. of True Wave II™ heaters. The large size of each heater allows for a lower surface temperature than other infrared sauna heater technology. This means better performance well within the optimal wave range of 7 to 14 microns with a good portion of wavelengths at 9.4--which is the frequency at which the human body absorbs infrared heat. Wood Type : Grade "A" Clear Cedar. Tongue & Groove construction -double wall tongue and grove construction - absolutely no veneers used! The Sanctuary C is made from grade “A” clear western red Canadian cedar wood and tempered glass. We use double wall tongue and groove construction. True Wave far infrared heaters: Back wall, side walls, under bench, calf and floor. True Spectrum full spectrum heater located on front wall. Complete Lifetime Warranty on ALL components backed by our 19+ years in business. Clearlight infrared saunas are designed by a doctor, not simply endorsed by a doctor! 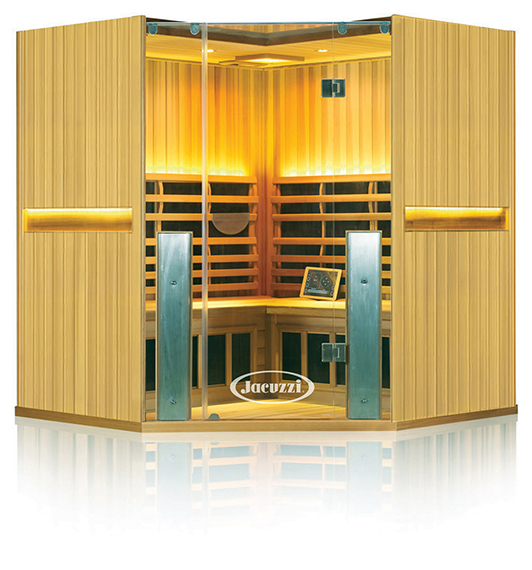 Order your Clearlight Sanctuary C 4 Person Cedar Sauna from FitnessZone.com today!